1. Microwave the courgette spaghetti for 1 minute. 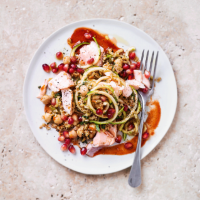 Stir the dressing pot into the freekeh salad and toss in the courgette and pomegranate seeds. 2. Remove the skin from the salmon and break it into large flakes. Gently toss it into the salad.